What is the difference between weather files? Weather files are divided into two main categories, satellite based, and ground based. There are advantages and disadvantages to each, which are important to consider if you're in an area that has multiple sets of weather data available. Ground based weather files in HelioScope come from TMY2, TMY3, or EPW sources. They are highly dependent on the quality of measurement equipment and practices employed at the weather station. Files from major metropolitan airports are generally better quality than a weather stations in a remote locations or those used for other purposes, but it is not always the. Despite this potential inconsistency, ground based weather data can be the highest quality available for a location as it considers irradiance from below the cloud level. It is also important to make sure that the data is close to the project location. Move too far from the source, and the data may be inaccurate, particularly if microclimates or coastal weather effects may be at play. Which weather file should I use? If you do not have rules established for which weather files you use, you may run multiple simulations to aid in your comparison. 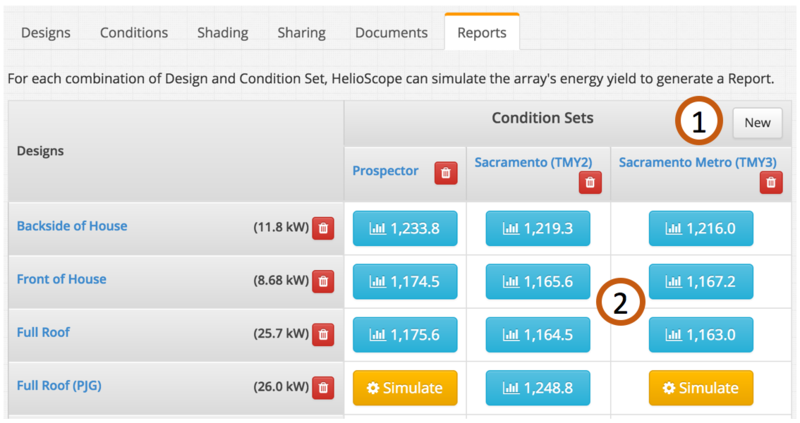 First create multiple condition sets to simulate your reports with different weather conditions. Then, compare the output from these simulations and select the file based on your desired criteria.